Drugstore Lip Stains Review: can we have kiss-proof lipstick? For a long time I didn’t want to use lipstick. Many of you will be like: “what’s wrong with you!” But I hated that it would transfer on anything (or anyone) my lips touched (and my boyfriend hated it as well), plus I like to look all day like I looked in the morning when I just get out of the house. My whole world opened up when I discovered lip stains! The idea behind this product is to have ultra-long lasting no-transfer lip color. Seems like the perfect deal to me! So I went and bought one of each color I would want to wear and tried out different brands as well. 510 Red Passion, a bright blue-toned red lip, of all it is my favorite color to rock in the evenings. Wijcon Make It Long Lasting Double Gloss comes with the same double-ended principle with a stain side and a clear lip gloss on the other. I bought this in Italy from the new shop they opened and really wanted a bright pink color (704). However, this formula didn’t stay very long and was way too glossy for me. Using the stain alone made me feel like a sticky mess for a long time and it didn’t dry to a long lasting color as the Rimmel ones. Elf (Eyes Lips Face) Lip Stain in Lucky Lady, was another miss from the long-lasting power, but the color is a very natural peachy color that will look amazing on most skin tones. These also come with a clear lip gloss on the other end, but since I don’t like to have sticky lips, I don’t use it. Rimmel Apocalips in Galaxy, was the most recent buy (see the feelunique haul post) and I love the dark rose color. The staying power is good and it doesn’t dry out your lips as much as the others. Max Factor Lipfinity in 185 Sultry. This lip stain comes in two separate tubes, the stain in one and a lip balm in the other. I like the formula and the fact that it comes with a balm to battle the dryness of the stain. 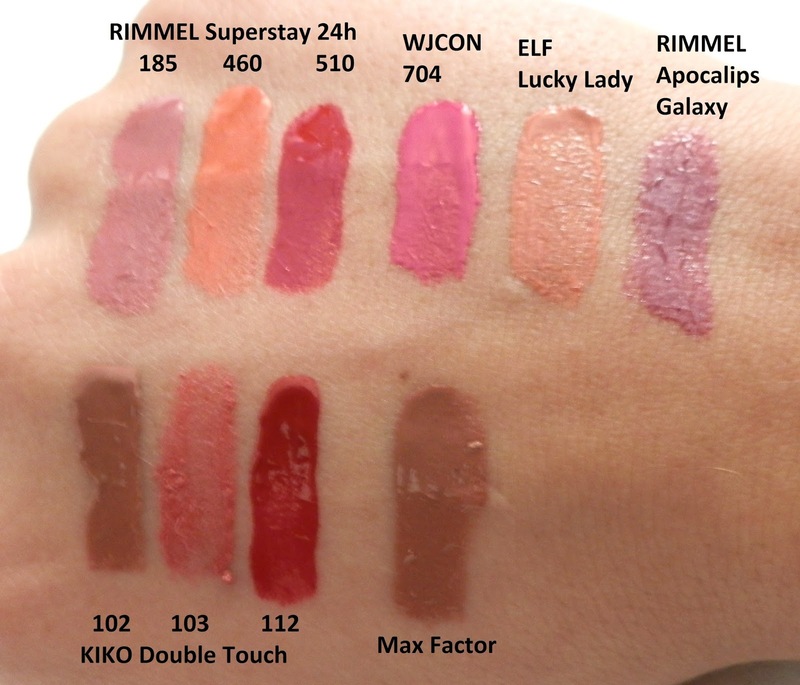 So here it is, all in all my favorite ones are the Rimmel 24h lip stains for staying power and i don’t mind them making my lips feel dry because then I just apply the lip balm that comes with it. My favorite night combination is to use the Rimmel 510 Passionate Red first and on top of that the KIKO 112 darker red to have a nice deep color. Essence Big Bright Eyes: the brow lifters!